Written by: Nicole Ciacchella on June 19, 2014. Since this is the second book in a series, it’s only fair to forewarn readers that both the book description and review may contain spoilers for the first book, so proceed at your own risk! Otherwise, pick up a copy of Brilliance, the first book in the series–you won’t regret it. Nick’s trials and tribulations have only just begun. The Children of Darwin (COD) has taken over three American cities, holding them hostage and bringing anti-Brilliant sentiment to a boiling point. Newly appointed as a Presidential adviser, Nick tries to negotiate a solution, but powerful forces want to institute such draconian measures against the Brilliants as microchipping and internment. As the situation grows increasingly desperate, it becomes obvious that both sides may be willing to set the country on fire to get what they want. 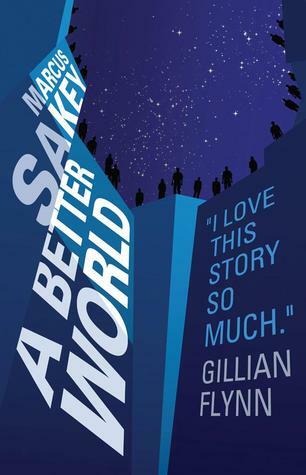 Marcus Sakey’s A Better World is just as gripping and thrilling as Brilliance. As an avid fan of the ill-fated TV show Alphas, this series fills a gaping hole in my life. If you enjoy narratives about people with special abilities–psychic powers, unnatural adeptness with machines, etc.–this series is not to be missed. The obvious plot twist – I won’t say what it is, but readers will know it when they get to it. Still, it was the only thing about the book that made me cringe a bit, but I’ll cut the author some slack because the book is otherwise so fantastic. Nick – I love this character and never stop rooting for him. He’s good at heart, but his position necessitates that he make difficult decisions, and he doesn’t shy away from making them. Yet even when he does what he knows in his heart is right, he suffers the consequences and questions himself. I like the moral greyness and I like Nick’s awareness of it. I also never cease to enjoy the insight the reader gets into Nick’s ability and how it works. It’s just cool, and I so enjoy those moments when the pieces snap together and he gets what’s going on. As cool as Nick’s ability is, though, it’s also something of a curse because it gives him more insight into other people than anyone should have. The Brilliants – This is where I’ll totally geek out. I mentioned Alphas, and I can also draw some comparisons to the TV show Heroes or the book Graceling. In each case, characters have abilities than transcend humanity’s normal boundaries, but those abilities are random and not always useful. They also prove a burden to the people who have them, making them subject to the mistrust and fear of regular old humans, who are terrified that evolution is leaving them behind. I enjoy how narratives like this create tension between the fun factor of reading about people with super abilities and the deeper messages these narratives convey. On its surface, Sakey’s tale about people with astonishing abilities is a sci-fi action romp, but it’s also a lens for considering xenophobia, racism, sexism, and pretty much any other -ism imaginable. The common thread that binds stories like these is how humanity is often driven to self-destruction as a result of irrational fear, when they’d be better served by calming down and trying to figure out how to deal with the brave new world facing them. The plot – Things ended on a pretty sour and worrisome note in Brilliance, and this book picks up from there. The country begins to implode, and it’s fascinating and horrifying to watch it happen. Nick comes to a devastating realization about how his past actions influenced what ultimately happens, tying the two books together very nicely. There’s also a huge reveal that poses all sorts of interesting new questions I imagine will start occurring in the next book, and that could lead to considerable expansion of the universe. If you like a read that never slows down, this book is definitely for you. It’s one of those chained-to-my-book-leave-me-alone-I’m-busy kind of reads, which also makes it the kind of read that’s a bummer to finish. My husband tore through the book in one day, and when he put it down, he said, “Where’s book three?” My sentiments exactly. Cleveland – Sakey brings a new character on board in the form of Dr. Ethan Park. Park, his wife, and his three-month-old daughter live in Cleveland, one of the cities taken over by COD. Reading about the city’s gradual decline is compelling, and it creates something of a post-apocalyptic world within a normal world–outside of Cleveland and the two other COD-occupied cities, it’s business as usual. It’s always fascinating to read about how people try to cope with a world gone awry, and Cleveland is no exception. It starts out small enough, with Park trying to find formula for his daughter, and picks up steam from there, showcasing how a climate of fear can bring out the worst in people. Park is also a compelling character in his own right, and I thought the confrontation scene between him and his wife was particularly well-done. The world building – The books are set in the U.S., but it’s a U.S. influenced by huge changes in humanity. The Brilliants started emerging in the 80s, so the books are contemporary, taking place in an alternate universe of sorts. The effects of the Brilliants are woven through every aspect of the story, from the political climate to pop culture. Sakey delves into several aspects of his world, skipping from the regular old human part to New Caanan Holdfast to Cleveland to one of the Academies for child Brilliants. Sprinkled throughout the book are things like fliers containing public service announcements, transcripts of White House press conferences, advertisements, etc. I liked these artifacts in the first book, and I enjoyed them here as well as they help create a very complete picture of the Brilliance universe. Obviously this is a favorite series of mine, and I could go on about it at some length, but I wouldn’t want to spoil it for anyone. Instead, I’ll wait patiently until you get a copy, then we can rave about it together. Sincere thanks to the publisher for providing me with a review copy. I just finished reading both books in like 2 weeks! Do you know or have you heard when the third book is coming out? I just did a google search and nothing was found…Thanks!